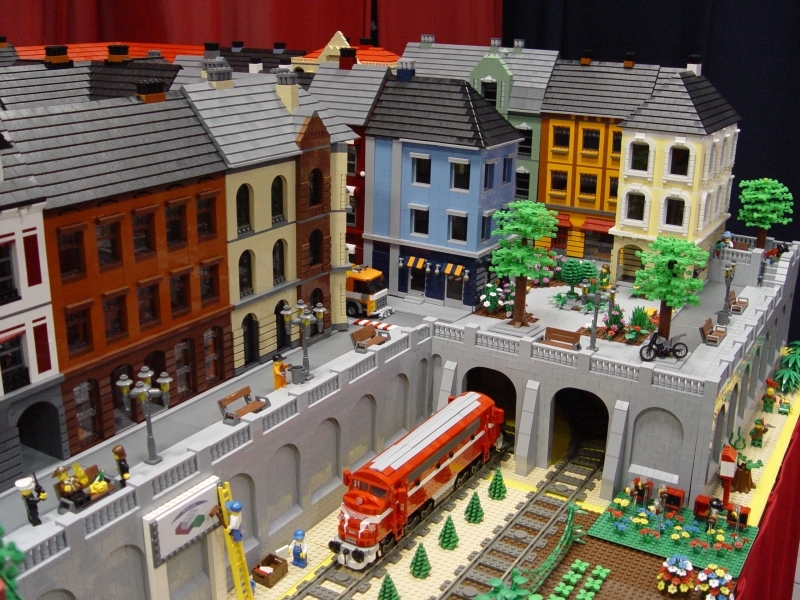 Brick Town Talk: Duna Plaza Layout II - LEGO Town, Architecture, Building Tips, Inspiration Ideas, and more! A good friend of the blog, Akos, gave us a complete explaination about the layout and its participants. "This town layout will be on display through March in Duna Plaza, Budapest, Hungary. It is part of a LEGO exhibition. The raised section on the extreme right is by "brob". He has been building his MOC layout for about 18 months. That's not a lot of time, but he started before CC was released and he did not consider switching to CC as his original intention was to build a fixed train layout for the home, for his son to play with. This is his second show with us, it looks like he will be a regular participant. He's got a rural section as well, but he did not bring it to this layout. The middle-right section is by Tibicsoki, he is a pretty unusual builder, who can go to extremes. He can build the ugliest house, and we can't convince him it should be demolished at the earliest occasion. On the other hand, he also built that cathedral, and in just 3 weeks. He is also very good with scenes, he built the flee-market scene and the vegetable patch "impromptu". He is not a CC builder either. (We have "invented" a CC-like standard in 2004 and he is still keeping to that standard.) The next middle-left section is by me. This is the first time I used my black tile streets. My new square and the wide streets let my houses to breathe. (Not to mention it was cheaper than building 8 more houses.) A club member suggested that I integrate my vintage stuff into the modern era town by making it a movie shooting. I did some last minute building and came up with some "movie" MOCs. My part is the only CC-ish section in the layout, but I have to tell that I also moved away from true-CC a bit. I got a few thousand 2x2 bricks so I could finally build the missing walls for my houses. (I only built facades before.) Now that my houses were "full", the integrated sidewalks had to go. I have replaced the 32x32 (or 2x16x32) baseplates "under" each house, and the sidewalks are on their own baseplate now. This way they can be packed away into smaller boxes. The leftmost section was filled with MOCs by "small" builders who don't have enough stuff to fill a whole section. They are GP, Lezly and piszkosfreddy. There were some individual MOCs that ended up in Tibicsoki's section. (By GP, Gyurma77 and Matyo)."